Home Android How to send any file on WhatsApp: games, apk, zip, rar etc. [Official]How to send any file on WhatsApp: games, apk, zip, rar etc. WhatsApp is the most popular messaging app and have billions of active users. Whatsapp is popular because of its simple UI (User Interface) and it also works on the slow internet. 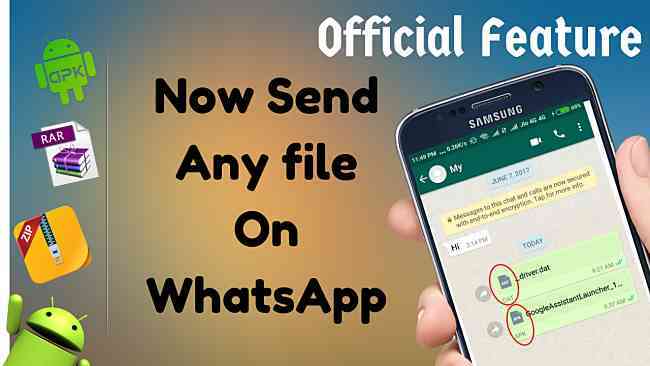 There are so many features that you already know about WhatsApp like sending photos, videos, contacts and document files as well but WhatsApp just added a new feature and now you can send any file on WhatsApp such as zip files, rar files, and many other file extensions included. it’s very easy to get this feature in your WhatsApp you just need to update you WhatsApp but here is a short guide about How to get this feature and send any file on WhatsApp. Video Guide at the end of article. Also read: MIUI 9 new features, leaks, and release date. Go to your PlayStore and Update your WhatsApp. Now open it and choose any chat to send any file and tap on attachment option. now tap on document option. Choose your file(apk, rar, zip or any other) and send it. So this is the guide about latest feature i hope this information will be helpfull for you. Please share it and subscribe our youtube channel.